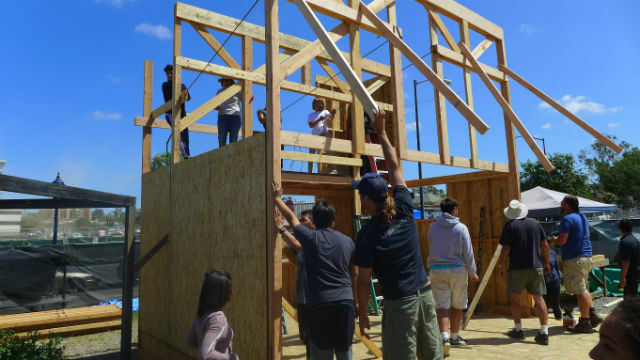 State lawmakers have introduced more than 130 bills this legislative session to try to solve California’s housing affordability crisis, proposing everything from 150 square-foot apartments to a $3 billion affordable housing bond. Will any of this stuff finally help me move out of my parents’ place? Nearly a decade removed from the depths of the Great Recession, a staggering 38 percent of California’s 18 to 34-year-olds still live with their parents, according to U.S. Census data. That’s roughly 3.6 million people stuck at home. Think of it this way: If “unlaunched” California millennials formed their own state, they would be entitled to more electoral votes than Connecticut, Iowa or Utah. If they formed their own city, it would be the third largest in the country. And the trend appears to have accelerated over the past few years. Many researchers expected that so-called “boomerangers” of the recession would flee their parents’ domiciles once the economy recovered and the labor market started roaring again. But California has its lowest unemployment rate since 2007, and millennials still aren’t moving out. So what exactly is keeping California’s millennials from breaking free of their parents? Part of the explanation is intuitive–California’s skyrocketing housing costs. But digging deeper into who exactly these stay-at-homers are, and how they’re different from younger adults from previous generations, shows other forces are also at play. Wasn’t it Pretty Common for Previous Generations of Young Californians to Live at Home for Awhile? At least not compared to today, or to the rest of the country at the time. In 1980, when baby boomers were young adults, only 1 in 5 younger Californians lived with their parents. That fraction ticked up only marginally for more than two decades and roughly kept pace with what was happening in the rest of the country. But since the turn of the millennium, the ranks of the stay-at-home have increased dramatically. 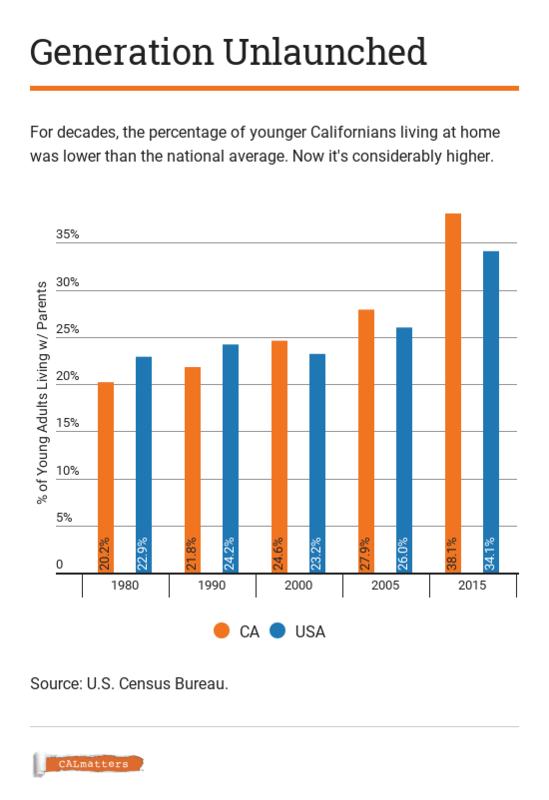 Between 1980 and 2000, California saw about a 5 percentage point increase in its share of young people living at home. Between 2000 and 2015, that percentage grew by 14 points, outpacing the trend in the rest of the country. How Bad Is it Here Compared to Other States? Aging California parents and their adult children can take some solace in the fact that many of their out-of-state relatives are experiencing the same type of overcrowded household they are. California has the sixth highest rate of millennial stay-at-homers in the country. But we’re not close to touching New Jersey, where 47 percent of 18 to 34-year-olds live with mom and/or dad. In keeping with what we know about income mobility patterns across the U.S., young people in the “Plains States” tend to live more independently. In North Dakota, an astonishingly low 14 percent of young people live at home. California does the worst out of all its West Coast neighbors, leading Arizona, Oregon, Washington and Nevada by a significant margin. 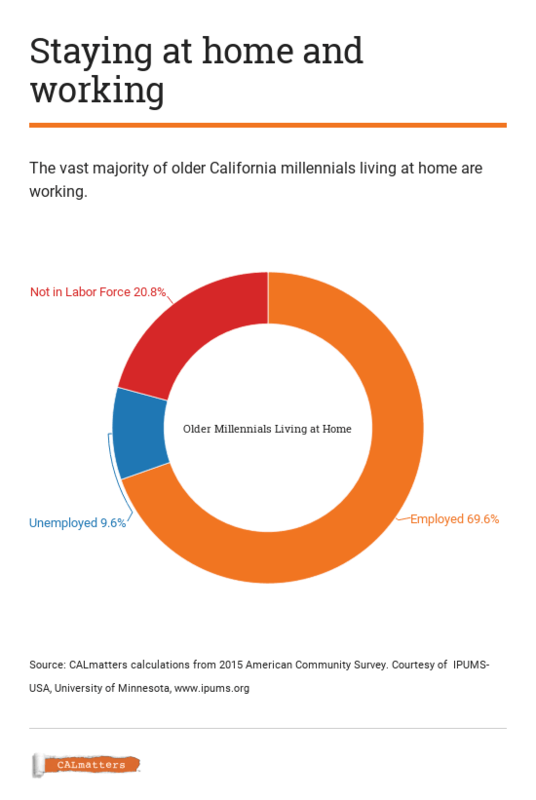 Let’s focus on older California millennials still living at home—those in the 25 to 34-age-range, who conceivably have had more time to complete schooling and enter the workforce. 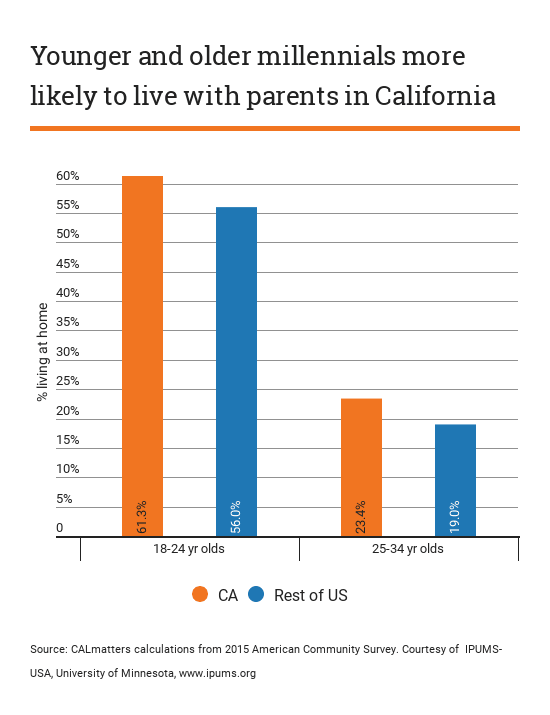 According to a CALmatters analysis of American Community Survey data, about 1 in 4 Californians age 25-to-34 live with their parents—more than 1.3 million people. The vast majority of this population is working or in school—most are not lounging around idly. About 70 percent of older California millennials living with parents reported being employed in 2015. About 20 percent also report being in school (those activities are not mutually exclusive). In fact, significantly more of these Californians are enrolled in school than their counterparts elsewhere in the country. The problem lies in how much money these older millennials make. The median earned income for an older millennial living at home is around $21,000 (among those with positive earnings). That’s not chump change, and it’s slightly more than what older millennials who live at home elsewhere in the country make (around $20,000). But it’s not a lot, and it’s less than what younger people from previous generations of Californians used to earn. In inflation-adjusted dollars, median earnings for full-time working young adult Californians have dropped by 11 percent since 1990. That follows a national pattern of wage stagnation for younger Americans. And leaner earnings are especially problematic for younger Californians because…. More than 40 percent of all older California millennials living with their parents are in the greater Los Angeles metro area, one of the highest-cost rental markets in the country. Another 10 percent are in the San Francisco-Hayward-Oakland area. According to the apartment rental listing site Zumper, a median one-bedroom apartment in Los Angeles goes for $2,090 a month, and in Oakland a one-bedroom goes for $2,060. While those prices are on the higher side of median estimates, both easily surpass the monthly take-home of the typical millennial at home with mom and dad. Still, even more affordable parts of the state with concentrated poverty see a large number of stay-at-homers. While sample size constraints make precise estimates unreliable, the El Centro metro area, where a quarter of the population fall below the poverty line, saw roughly 40 percent of its 25-to-34 year olds live at home. It’s difficult to disentangle the decision to live at home from other major life choices—especially marriage. Young people with a spouse are much more likely to live away from home than the unmarried. 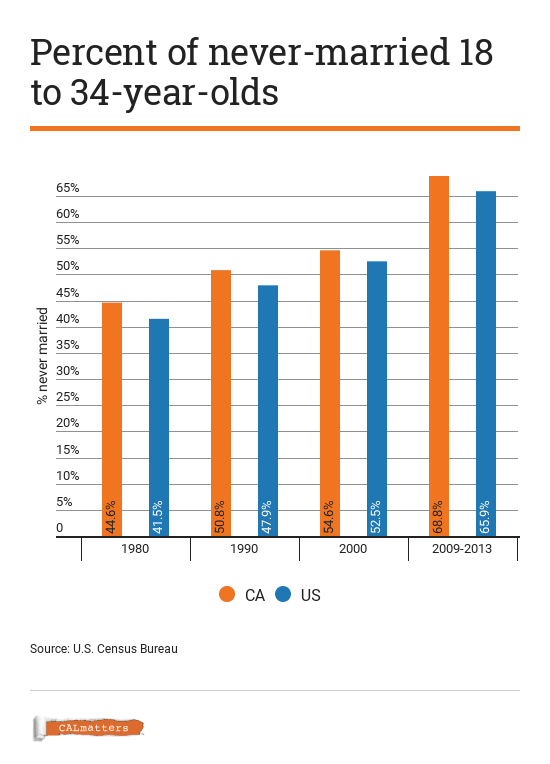 And the proportion of young unmarried Californians, much like elsewhere in the country, has grown significantly over the decades. But are young people postponing marriage because they’re living at home, or are they living at home because they’re postponing marriage? It’s a chicken-and-egg question for demographers. The value of education in the workforce is also an important factor. Completing at least four years of college gives you an 83 percent chance of avoiding living with your parents in your late 20’s and early 30’s, about 8 percentage points higher than if you complete less education. So even if legislators were magically able to reduce housing costs overnight, it will still be difficult for single, young adults with lower education levels to strike out on their own.